Everything starts with an idea. Everything that you see around you – your phone, computer, car, coffee mug – all came from someone’s mind. Before you can do anything with an idea, you’ve got to put it down on paper, or using software that allows you to create clear visual links. Unlike your phone, where you can make written or voice notes, writing an idea down - with visual connections between different aspects of your thought process unlocks creativity in ways that isn’t possible with note-taking. Mind maps are perfect for outlining big ideas and visualizing smaller ideas that relate into your memory. Mind maps are a great way to join the creative dots and unleash the potential of your idea. Mind mapping is a technique for capturing information and visualizing thought processes, invented by the author, speaker, and self-described brain expert, Tony Buzan. Mind maps can be used to aid learning, to present information, or as a tool for brainstorming and developing ideas. The key to mind mapping is visualization. It's the visual elements that allow you to make connections, remember links, and spark new ideas. For entrepreneurs and students, academics and developers, a mind map is the first step towards turning an idea into reality. It gives you the scope to identify challenges and road blocks, map various aspects of the journey, plan your next steps and present your ideas to stakeholders, tutors or colleagues. Mind maps can either be drawn by hand. If possible, use a large piece of paper, either on a flipchart or white board, if you want to make changes before committing your thoughts to something more permanent. Or you can use an app. 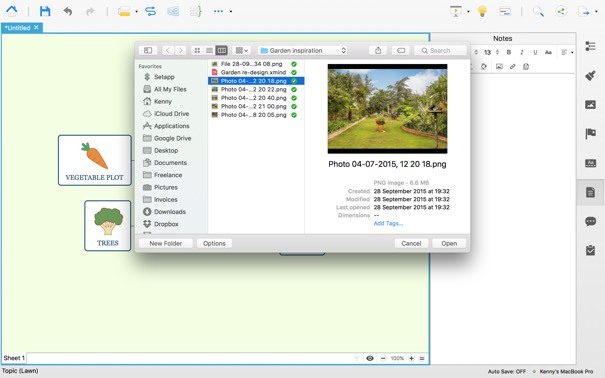 Apps such as XMind and iThoughtsX - both available in Setapp and brilliantly simple to use - come with extensive visual functionality and the ability to share with others and yourself, so you can start documenting ideas with minimum fuss. Mind mapping tools are effective ways to put an idea on paper and make changes as it evolves. Let's start with quick guide to mind map. Every mind map starts with a central idea. That can be a topic you want to explore, the theme for a presentation, or an idea you want to develop. Start with brainstorming before beginning to draw. Your central idea - main goal or challenge - should be represented visually, in the center of your mind map, in a way that grabs attention and makes it clear what you're describing. It can either sit at the left of your mind map, with branches expanding in front, above and below it, or it can be right in the middle of the page, with branches expanding from all directions. Notice: XMind calls it a topic, but it's the same thing. It's automatically placed on the page when you open a new blank document. Double-click the text to rename it with your central idea. Think about your goal or challenge from the highest level. What are the key, the driving elements to what you are trying to achieve? If you are creating a marketing strategy, for example, your top themes wouldn't include social media, blogs, and landing pages. You would start with the message and audience (who are they, personas, etc. ), and other key themes to consider, before diving into the detail. In the same way that working on an academic paper involves understanding the key questions to answer after you've done the background reading to give you a top-level overview of the subject. Start with the big ticket items, then move into the detail. To create a secondary node, or sub-topic as XMind calls it, click on the central topic and tap the Tab key. To add more sub-topics, keep tabbing with the central node selected. To add topics branching off the sub-topics, click on a sub-topic and hit Tab. These steps work for all popular mind mapping tools. In the mind mappers you can change the shape of the node, as well as its color and the thickness of its border. You can also change the font, color, weight, case, and size of the text. Here is where you outline the smaller details, e.g. how you answer the big questions and what methods you use to achieve your marketing plan objectives. Don’t worry if every branch of the mind map fills up with with a lot of ideas. You don't have to implement everything you write down. Mind maps are a chance to unlock what is possible before focusing on the implementation element of the plan. Remember we said earlier that the visual elements of a mind map are important? Here's where you add them. Almost all mind mapping tools have a collection of clip art and icons you can add to your mind map. Also, you can add any image you like, provided it's stored on your Mac. Then, add some information about a topic - notes, keywords, and phrases - like who assigned to complete the task and when it must be completed. Images are great for conveying a message, but sometimes you need to add more detail. A finished mind map should outline all of the ways you could achieve the answer/solve the problem at the centre of the map. It doesn't mean you will do everything written down; but this should prove a useful starting point. Everything on the mind map should lead back to the core theme. 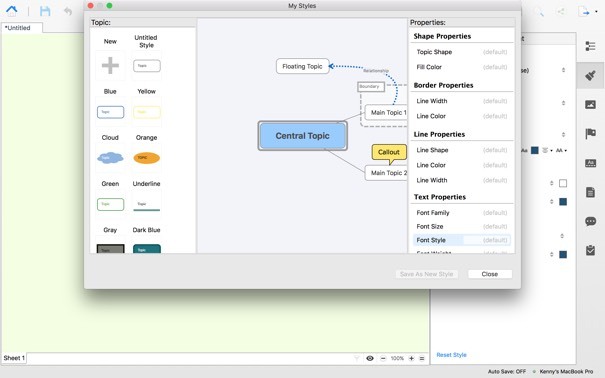 You can now add more topics and add images and other details to them to flesh out your mind map. As well as the elements we've discussed, you can add markers to each topic, such as a day of the week icon, a progress meter, or a priority badge. Using icons and images in this way is a great way of conveying detail in your mind map without adding too much text. Don't be afraid to experiment with themes and colors. Remember, the idea is to make it stand out and be visually stunning! From the various threads and sub-threads of the idea, should emerge a solution, or series of steps that you and anyone else involved can implement. The most effective mind maps lead to actionable outcomes, which is a sign of a positive mind mapping session. 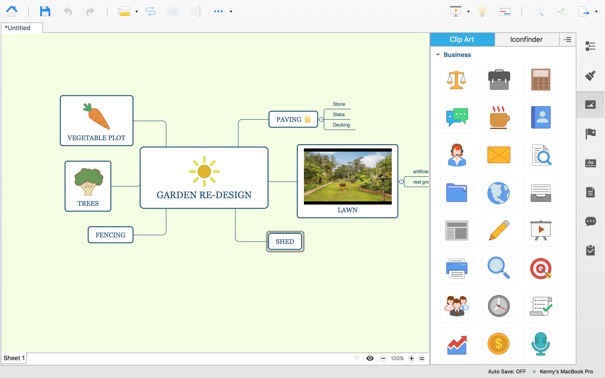 The most well-known mind mapping tools allow you print the mind map, export it in one of many supported file formats, or press the share button to share it on social media, the web, or by email. And cloud integration allows you to sync, view and edit mind maps online, on your Mac, iPad or iPhone so that you can brainstorm on the move! Basically, anything that you want to achieve with your mind map, can be done here. With tools, available on Setapp, you've got the ability to create visually appealing mind maps, upload documents and files, and sync between devices and other people involved in the project. At the creative stage of any project is an exciting opportunity to imagine everything that is possible. A mind map is one of the most effective ways to unlock your problem solving capabilities and visualize a way forward.